Tigercat’s new 880 purpose-built log loader is receiving the “thumbs up” working for logging contractor Blue Valley Enterprises in B.C.’s Central Interior. The performance of Tigercat’s new 880 purpose-built log loader has ticked all the boxes during its first winter of work in the real world conditions of British Columbia’s Central Interior. “We’ve had the machine since last August and it hasn’t missed a beat,” reports George Funk, principal in Blue Valley Enterprises Ltd, based in Vanderhoof. On one occasion there was an availability issue with an oil filter but that was it. Indeed. Good enough to attract the attention of other log harvesting contractors. 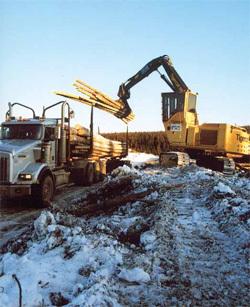 There’s now another machine working for a logging contractor in the Vanderhoof area and Funk regularly fields inquiries from other interested contractors outside the B.C. Interior region. 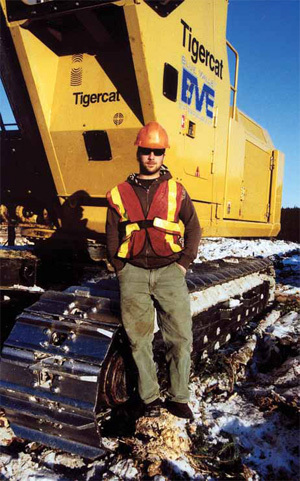 Key to the Tigercat 880’s market interest lies within its description as a purpose- built forest machine. For example, the 880’s upper frame assembly and undercarriage were specifically designed for forest duty. 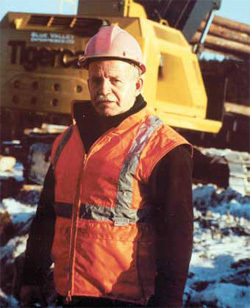 Tigercat’s people closely collaborated throughout the machine’s development with loggers like Funk, and Parker Pacific, its B.C. distributor, to introduce a solid machine designed for log loading but with the versatility to handle other forestry work like shovel logging or harvesting when equipped with the appropriate attachments. Meanwhile, a good contact from Madill landed with Tigercat and that provided Funk a degree of confidence.”We started talking and looking at their plans. The 880 looked like something that would work.” The machine was supposed to be similar to the Madill 2850 in weight but ended up a little heavier, he adds. The 880 slotted right in with the rest of Blue Valleys’ log harvesting line up which includes equipment from a mix of manufacturers. It includes a Tigercat 870 feller buncher, two Madill 2250 machines and a John Deere 903J. Two Deere 748 Gs, a Cat 235 and D5 track machine do the skidding and a Madill 2850 and a Deere 2054 handle the log loading work. There’s also a Deere 2154 excavator and a D6 Cat. Older equipment includes a Cat D8 (from 1964), a 966 wheel loader and 325 excavator and a 740 Champion grader. Wood processing is contracted out. Blue Valley builds about 30 kilometres of roads each year, mainly block roads for the company’s own use. Through its Evergreen contract and other licences, Blue Mountain will harvest around 275,000 cubic metres this year, all for Canfor. About 15 per cent of that is in 24 and 16 foot short logs. Vanderhoof has always been home for Funk —”born, raised and still here”—and since buying his first logging truck nearly 40 years ago, he has always worked for the same company, albeit operating under different names. It started off as David Martin & Sons, Funk’s grandpa. 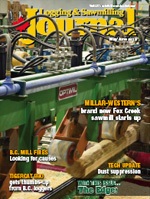 Since then it’s been known as Plateau, Westar, Slocan and now Canfor’s Plateau sawmill (again) located about 19 kilometres west of Vanderhoof. He tries to keep the same operator on a machine as much as possible, and Blue Valley doesn’t cross shift. “Operators like their own machine rather than sharing it and it’s harder to manage the night shift, although some fixed costs do decrease,” he explains. Normal shifts run from 5 a.m. to 4.30 p.m., with a half hour service period. “We’ve got good operators,” he adds. The 880 has a large capacity swing bearing for high torque. And the main hydraulic pump flow is reserved for the boom and travel functions with a dedicated pump for the attachment, which can equate with more speed and efficiency. That in turn can contribute to lower operating costs. And that’s what every logging contractor strives toward every time a machine is fired up.